"Clapham Junction" redirects here. For other uses, see Clapham Junction (disambiguation). 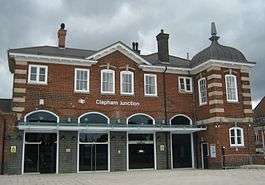 Clapham Junction railway station (/ˈklæpəm/) is a major railway station and transport hub near St John's Hill in the south-west of Battersea in the London Borough of Wandsworth. 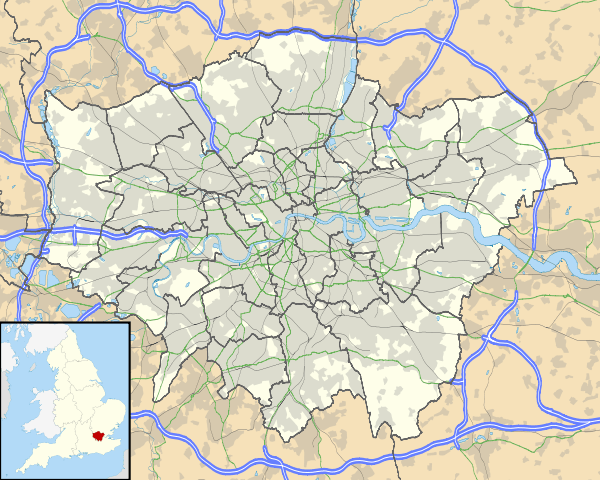 Despite its name, it is not located in Clapham, a district situated some 1.5 kilometres (0.93 mi) east-south-east of the station. Routes from London's south and south-west termini, London Victoria and London Waterloo funnel through the station, making it the busiest in Europe by number of trains using it, between 100 and 180 per hour save for the five hours after midnight. The station is also the busiest UK station for interchanges between services. Before the railway came, the area was rural and specialised in growing lavender; the street Lavender Hill is east of the station. The coach road from London to Guildford ran slightly south of the future station site, past The Falcon public house at the crossroads in the valley between St. John's Hill and Lavender Hill. On 21 May 1838 the London and Southampton Railway became the London and South Western Railway (L&SWR), and opened its line from Nine Elms as far as Woking. That was the first railway through the area but it had no station at the present site. The second line, initially from Nine Elms to Richmond, opened on 27 July 1846. Nine Elms was replaced in 1848 as the terminus by Waterloo Bridge station, now Waterloo. The line to Victoria opened by 1860. Clapham Junction opened on 2 March 1863, a joint venture of the L&SWR, the London, Brighton and South Coast Railway (LB&SCR) and the West London Extension Railway (WLER) as an interchange station for their lines. When the station was built, much of Battersea was the site of heavy industry while Clapham, a mile south-east of this point, was fashionable. The railway companies, to attract a middle- and upper-class clientele, seized the unindustrial parish calculating that being upon the slopes of Clapham's plateau would only re-inforce this distinction, leading to a long-lasting misunderstanding that the station is in Clapham. The railway companies were not alone in eschewing the name of Battersea; from the 1880s until the 1950s the imposing private houses forming the streets of the district were commonly recorded by property-owning residents as 'Clapham Common N. Side, London' and 'Clapham Common W. Side, London' despite being well away from those park-side streets. 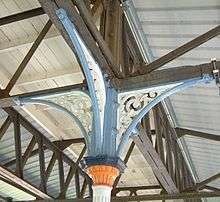 Additional station buildings were erected in 1874 and 1876. Whereas the station brought wealthy streets to Battersea its adjoining (entirely modernised) manual railway works and the large Battersea Power Station brought slums, the population of which rose from 6,000 in 1840 to 168,000 by 1910. Battersea's slums unfit for human habitation were entirely replaced with council and charitable housing between 1918 and 1975. A 'Heathrow Airtrack' to reduce the 95-minute journey by tube and Gatwick Express to Gatwick and unite the Great Western Main Line with Heathrow, Gatwick and the South Western Main Line was cancelled in 2011 following improvements to the 2005-built Heathrow Connect track from Hayes and Harlington and practical impediments, such as pressure for continued high-frequency services on the three deemed-'entrenched' semi-fast and slow services between Clapham Junction and Staines. Overground, the change would have been at Clapham Junction. On the morning of 12 December 1988 two collisions involving three commuter trains occurred slightly south-west of the station. Thirty-five people died and more than 100 were injured. On the morning of 16 December 1991, a bomb ripped through tracks on one of the station's platforms, causing major disruption to the rail network. The Provisional Irish Republican Army (IRA) claimed responsibility. A 1912 Railway Clearing House map of lines around Clapham Junction. Latchmere SW Junction connecting the WLL to the Windsor lines at Ludgate Junction. Latchmere Main Junction connecting the WLL to the Brighton Line at Falcon Junction. West London Extension Junction and Junction for Waterloo, relaid for Eurostar empty-stock moves from the Windsor Lines to the WLL. Pouparts Junction where the low-level and high-level approaches to Victoria split. Each day about 2,000 trains, over half of them stopping, pass through the station, more than through any other station in Europe. At peak times 180 trains per hour pass through of which 117 stop. It is not the busiest station by number of passengers, most of whom (about 430,000 on a weekday, of which 135,000 are at rush hours) pass through. Interchanges make some 40% of the activity and on that basis too it is the busiest station in the UK. In 2011 the station had three entrances, all with staffed ticket offices, though only the south-east entrance is open 24 hours a day. 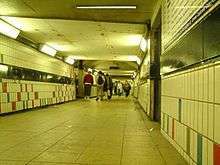 The most heavily used of the three, this leads from St John's Hill via a small indoor shopping centre into a subway some 15 ft (4.6 m) wide, that connects to the eastern ends of all platforms. The north entrance, which has restricted opening hours, leads from Grant Road to the same subway. The subway is crowded during rush hours, with the ticket barriers at the ends being pinch points. The south-west entrance, also known as the Brighton Yard entrance, as the buildings still bear signage for the London Brighton and South Coast Railway, is of a more traditional appearance, with a Victorian station building set at the back of a large forecourt. This entrance leads to a very wide covered footbridge, which joins the western ends of all platforms. This entrance includes cycle parking and a taxi rank. It was re-opened in May 2011 as part of a wider programme of access improvements that included installing lifts to the platforms. There are public and disabled toilets at the south-west entrance. There are refreshment kiosks in the subway, on the footbridge and on some platforms; and a small shopping centre, including a small branch of Sainsbury's supermarket, in the south-east entrance. British Transport Police maintain a neighbourhood policing presence, whereas the Metropolitan Police Service and the part-Transport For London funded Safer Transport Command provides a police presence in the area outside the station. 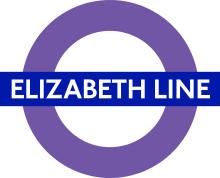 9 December 2012 saw the opening of a new platform for the East London Line, creating an orbital railway around inner London. Overcrowding is most frequent in the often convenient but narrow cross-platform subway. Using this rather than the wide, elegant flying concourse for interchange, a visitors' eyes assessment of fabric and environment listed Clapham Junction in the most needy 10% of Department for Transport category B stations. Platforms 1-2 are northeast-facing bay platforms, used by the London Overground services to and from Highbury & Islington. Usually, platform 1 is served by trains via Willesden Junction, while platform 2 is used by services via Canada Water, although this usage can be reversed. Platforms 3-6 are through platforms used by South West Trains services going to or from Putney and beyond. Sidings leading into railway sheds at the west of the station are located between platforms 6 and 7. Platforms 7-11 are through platforms used by South West Trains services going to or from Wimbledon and beyond. Some long-distance services (from places such as Portsmouth Harbour or Weymouth) that do not call at the station also pass through these platforms. Platforms 12-15 are through platforms used by Southern services that start or terminate at London Victoria. The non-stopping Gatwick Express services also pass through these platforms. Platforms 16-17 are through platforms used by Southern services on the West London Line (to or from Watford Junction or Milton Keynes Central). During emergency engineering works, these platforms can also be used by some London Overground services to and from Willesden Junction. Currently, the voices of Phil Sayer and Celia Drummond are played at this station in automated station announcements. All South West Trains services from Waterloo pass through the station, as do Southern and Gatwick Express trains from Victoria. The West London Line and East London Line services of London Overground have Clapham Junction as one of the termini. During peak hours express services on the South Western Main Line and outer suburban services to Alton and Basingstoke typically do not stop at the station. In 2007 the alignment of one of the two variants of Crossrail 2, that via the station rather than Putney and Wimbledon, was safeguarded. The Department for Transport and Transport for London continue to discuss proposal for a Clapham Junction Northern Line extension and its London Underground alignment has been legally reserved through Battersea Park, and would connect Clapham Junction to the London Underground for the first time. Government and Network Rail funding for in the early 2010s of £50 million of improvements was granted. This comprised an upgrade to the main interchange: new entrances and more retail. London Buses routes 35, 37, 39, 49, 77, 87, 156, 170, 219, 295, 319, 337, 344, 345, 639, 670, C3 and G1 and night routes N19, N31, N35 and N87 serve the station. ↑ The 2009 Metro Shopping company plan included a new entrance on St John's Hill, the straightening and extension of platforms 15 to 17, more ticketing facilities, step-free access to all platforms by 2011, a new step-free entrance on Grant Road, and a new 'high street' from St John's Hill to Falcon Road with retail space and arthouse cinema. Profitable immediate funding was planned via radical height 42-storey residential buildings above the station. ↑ "Heathrow Airtrack Waterloo rail link shelved by BAA". BBC News London. 11 April 2011. Retrieved 29 December 2011. ↑ Richmond/Clapham Junction to Stratford timetable Archived 13 February 2015 at the Wayback Machine. ↑ "£50m revamp for 'worst stations'". BBC News. 17 November 2009. Retrieved 17 November 2009. Wikimedia Commons has media related to Clapham Junction railway station.